Deadline reports that a competitive bidding war is currently happening between major Hollywood studios for the rights package to an American remake of the 2016 hit Korean zombie film Train to Busan. Among those bidding for the film are New Line Cinema, Universal Pictures, Paramount Pictures, Lionsgate Films and Screen Gems. Following the commercial success of The Nun,Gary Dauberman is set to write the horror remake’s script with James Wan producing. Train to Busan was directed by Yeon Sang-ho. It follows the story of a workaholic businessman and father who accompanies his doe-eyed daughter on the titular train ride to see her mother at the very same time that a malevolent virus breaks out, turning the populace into ravenous, milk-eyed ghouls. When one of those blood-sucking zombies gets on the train, Hell is unleashed and the father must team up with a gaggle of survivors to fight the dead and protect his child. 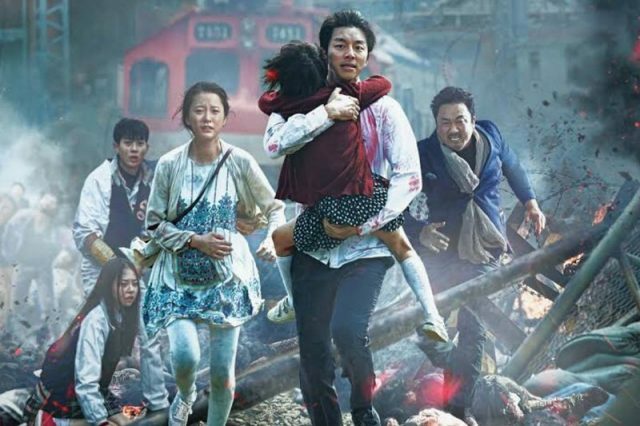 Train to Busan set the box office ablaze across Asia, smashed box office records in South Korea and became the biggest Korean film of all time, stars Gong Yoo (The Age of Shadows), Jung Yu-mi (Manhole), Ma Dong-seok (Along With the Gods: The Last 49 Days ), Choi Woo-sik (Big Match. Okja), An So-hee (Hellcats), Kim Eui-sung (Assassination), and Kim Su-an (The Battleship Island, Along With the Gods: Two Worlds). It was recently reported that a Train to Busan sequel is in works with the working title “Peninsula” which focus on the entire Korean peninsula. Director Yeon plans to begin production in the first half of next year. Currently, Dauberman is busy working on other horror films such as: the third installment to The Conjuring spinoff, Annabelle; IT Chapter 2 which scheduled to be release on September 2019; and the film adaptation of the iconic 90s Nickelodeon series Are You Afraid of the Dark? which is set to premiere on October 2019. Meanwhile, Wan is preparing for the upcoming release of Warner Bros. and DC Films’ superhero movie Aquaman starring Game of Thrones star Jason Mamoa. Wan is also busy with other projects such as Swamp Thing, The Curse of La Llarona, M3GAN and The Tommyknockers. The post Five Studios in Bidding War Over Train to Busan Remake appeared first on ComingSoon.net.